Light your way through the Advent season and use this Celtic cross candle holder to hold your Advent candles. 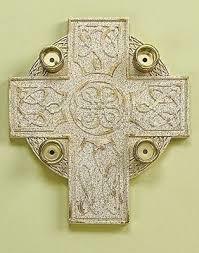 The Celtic cross candle holder is made of sturdy and durable resin and designed in a beige color to look like stone. Each arm and the center of the cross is adorned with raised Celtic knots and braiding which add to the Irish look of the candleholder. A gold candle holder is found at the end of each arm to hold the candles which are not included with this candle holder. The cross candle holder is 8-1/2 inches wide, 9-5/8 inches long and 1-1/8 inches high which is a nice size to set on a table or shelf. The Celtic candle holder is attractive enough to bemidst of seasonal greens which would contrast nicely with the simple stone look of the cross candle holder. It could be displayed as a table centerpiece and used by the family throughout the Advent season as a new candle is lit and prayers are said each week. The Celtic cross candle holder can be used as an attractive and inspirational alternative to an Advent wreath to mark off the weeks in preparation for the birth of Jesus. Candles NOT Included and sold separately.